I was somewhat hesitant as I sat in the audience listening to the familiar strains of the overture. Here we go again, not another G&S! And yet, as the curtains parted and the opening scenes unfolded I found myself chuckling, then laughing and then thoroughly enjoying myself. It is a long time since I have seen Ruth and Frederic’s scenes portrayed with so much common sense and audibility. I think it may have been the freshness of Frederic, who I’ll wager does not have a history in G&S, because he played it totally straight, without tongue in cheek. Ruth did the same, which made it all the funnier. And what a masterstroke to cast the mature ladies as chaperones. This not only neatly sidestepped the usual horror of seeing supposedly pretty daughters older than their father, the Major-General, but gave us an additional source of comic business during “Oh is there not one maiden breast”. With beautiful costumes and wigs the daughters came across superbly, with some strong singing from the youngsters Isobel, Kate and Edith. Mabel had a gorgeous voice and managed to sing each note as clear as a bell, even the top notes that the human ear could barely hear. The Major General sang well and the Pirate King was a likeable rogue with great presence. The men’s chorus suffered somewhat from the split between Pirates and Policemen since there was not quite enough critical mass of either during the vocals, although there was no problem with the movement, which was both convincing and funny. Once or twice the ensemble parted company from the orchestra but the reunion was swift. IMOG has been extremely lucky to keep many of the youngsters who were in The Boyfriend. I don’t know whether they could have cast it without them but they certainly did well, despite the vocal demands of operetta being rather taxing compared with the lighter shows. 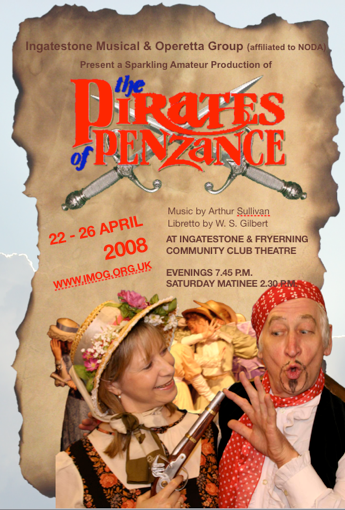 Overall, IMOG’s “Pirates” was excellent with some touches I had not seen before (eg the chaperones); all the costumes were good, especially Act One girls, and the sound system worked well when the rifle mikes weren’t being kicked!